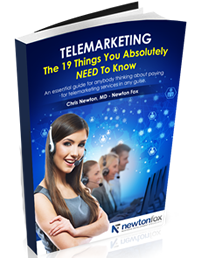 One of the services we are consistently asked for here at Newton Fox is B2B telemarketing or telesales. Business to business telesales involves calling up local businesses and setting appointments, or even selling to the relevant person within that company over the phone. In itself, business to business telesales poses many problems. For example, getting past the ‘gatekeeper’ (that person who is put in place to stop you speaking to the person you need to be speaking to) and also, when you do get through to the decision maker, saying the right words to keep them interested and on the phone, and then being skilled enough to turn that into a sale or appointment. Telemarketing takes a very special kind of person; they need to be fairly thick skinned as most people can be quite rude when bothered by a sales person. They need to be tenacious, but not too pushy, and they also need to be able to build a rapport very quickly with the person they are speaking to. It takes less than 15 seconds before someone mentally switches off to what you are saying. That is quite a short space of time which is very easily wasted by the wrong person. However, telemarketing and telesales is essential for many businesses to expand their own business, and finding the right person to introduce your company to your potential clients can be difficult. Here at Newton Fox, we take that headache out of marketing your company for you. There is no need for you to interview person after person, to find the one with the tenacity and the patience to make the calls you don’t have the time or the desire to do yourself. There is no need for you to have to monitor their performance, making sure they aren’t wasting your time and money and booking you qualified appointments. You don’t need to pay for the telephone bills, or for the specialist equipment which demands the productivity from your sales person you deserve. All you need to do is get Newton Fox involved and we will do the rest. We already have those people who are brilliant at business to business telesales or B2B if you prefer. They are professional, tenacious and hard-working, ready to get you introduced to the right companies for your businesses.